veresk13 has no other items for sale. 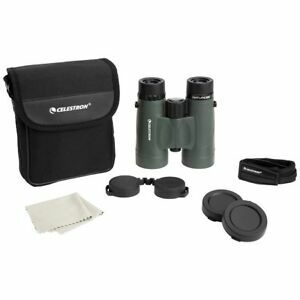 Feature packed, affordable, and lightweight, the Celestron Nature DX proves to be a first-rate companion for anyone who loves to head outdoors. Fully multi-coated optics and BaK-4 prisms provide bright images and sharper, more detailed views. Engineered with a strong and durable polycarbonate body, the Nature DX is meant to go along on many different adventures. Optical Features Fully Multi-coated Lenses Increase light transmission with multiple anti-reflective coatings on all air-to-glass surfaces. Phase Correction Enhances resolution and contrast through roof prisms. BaK-4 Prisms Optimize light transmission. Construction Features Roof Prisms Appreciated for a streamlined shape and durability. Polycarbonate Body Is lightweight. Rubber Armoring Provides a secure, non-slip grip. Multi-position Eyecups Twist up and down for comfortable viewing with or without eyeglasses. Center Focus Wheel Adjusts both binocular barrels at the same time. Right Eye Diopter Adjusts for differences in a user's eyes. Located by the right eyepiece. Design Features Waterproof Optics are sealed with O-rings to prevent moisture, dust, and debris from getting inside the binocular. This is my first set of binoculars and was purchased based upon the exceptional write-ups I'd read as to the optics and value of the set. I took these binoculars out the other day for the first time for some bird watching and found them to be easy to use in tracking birds in flight, and locating animals quickly. I am very pleased with the purchase. Good product but maybe not for everyone. Great optics quality, excelent light transmission, sharp optics...BUT: I am having some kindney-bean blackout issues. It took me a while adjusting the binoculars to find a sweet spot to almost (not 100%) eliminate the blackout. Maybe my eyes are getting older (I am 42) or my eye-socket balls are not perfectly aligned, I don't know. Works okay, but didn't seem any better than a smaller, fixed focus binoculars.